The well-studied cellulase mixture secreted by Trichoderma reesei (anamorph to Hypocrea jecorina) contains two cellobiohydolases (CBHs), cellobiohydrolase I (TrCel7A) and cellobiohydrolase II (TrCeI6A), that are core enzymes for the solubilisation of cellulose. This has attracted significant research interest because of the role of the CBHs in the conversion of biomass to fermentable sugars. However, the CHBs are notoriously slow and susceptible to inhibition, which presents a challenge for the commercial utilisation of biomass. The xylans and xylan fragments that are also present in the biomass have been suggested repeatedly as one cause of the reduced activity of CHBs. Yet, the extent and mechanisms of this inhibition remain poorly elucidated. Therefore, we studied xylan oligosaccharides (XOSs) of variable lengths with respect to their binding and inhibition of both TrCel7A and an enzyme variant without the cellulose-binding domain (CBM). We studied the binding of XOSs to TrCel7A by isothermal titration calorimetry. We found that XOSs bind to TrCel7A and that the affinity increases commensurate with XOS length. The CBM, on the other hand, did not affect the affinity significantly, which suggests that XOSs may bind to the active site. Activity assays of TrCel7A clearly demonstrated the negative effect of the presence of XOSs on the turnover number. 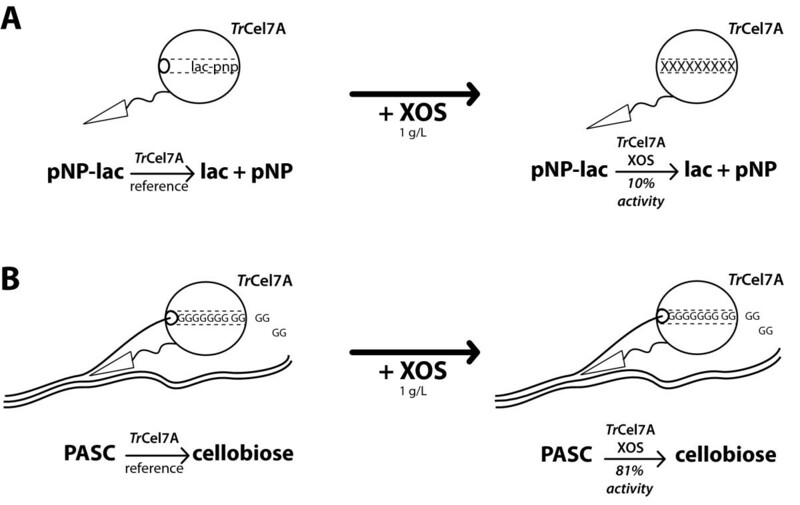 On the basis of these binding data and a comparison of XOS inhibition of the activity of the two enzyme variants towards, respectively, soluble and insoluble substrates, we propose a competitive mechanism for XOS inhibition of TrCel7A with phosphoric swollen cellulose as a substrate. Biomass is the most abundant raw material in the biosphere, and enzymatic biomass conversion of sugars and subsequent fermentation to transportation fuels has attracted enormous scientific and industrial interest . In typical biomass raw materials such as corn stover or wheat straw, cellulose is not present in pure form but is in close contact with hemicelluloses such as xylan, mannan and xyloglucan and encrusted with lignin . Many thermochemical pretreatments have been developed to disperse and dissolve the recalcitrant complex to make it more easily accessible for enzymatic hydrolysis . Several phenomenological studies have documented a negative influence of xylans and xylan oligosaccharides (XOSs) on the performance of industrial cellulase mixtures [4–7]. However, which enzymes of the commercial cellulases are affected remains unresolved. Furthermore, target sites and mechanisms of these effects remain to be investigated. Such information will clearly be needed when considering remedies for xylan inhibition. The term 'cellulase' most often refers to secreted cellulolytic enzymes of fungal origin. For instance, the cellulases secreted by Trichoderma reesei (anamorph to Hypocrea jecorina) contain several endoglucanases and two cellobiohydrolases (CBHs) which process exo-acting, cellobiose-releasing enzymes. The CBHs exhibit quite low reaction rates and non-Michaelis-Menten kinetics, which include an initial burst followed by a biphasic slowdown [8, 9]. Classical inhibition studies which result in an inhibition constant Ki are not applicable to cellobiohydrolases, because the concentration of the insoluble substrate cellulose is very difficult to measure and, as mentioned above, steady-state reaction kinetics are absent. In industrial batch hydrolysis of biomass CBHs can suffer from product inhibition, which is partially reduced through the cellobiase activity of added β-glucosidases [9, 10]. Traditionally, CBHs have been claimed to require free chain ends as starting points and free cellulose chain ends are in turn generated by endoglucanases, which hydrolyse the cellulose chain randomly in endo-fashion. However, this strict classification has been challenged by the demonstration of endo-attack by CBHs and processive action of endoglucanases . Cellobiohydrolase I (TrCel7A) is the most abundant enzyme secreted by Trichoderma reesei. It is a modular 52 kDa enzyme with a catalytic domain (GH7)  and a family 1 cellulose binding domain (http://www.cazy.org/), which are interconnected by a highly glycosylated linker [13, 14]. The catalytic domain has a tunnel-shaped active site with ten subsites . In this study, we investigated the apparent inhibition of TrCel7A by xylan products in a model system with XOSs, which are enzymatically derived from birch wood xylan. TrCel7A is used in two variants, the full-length enzyme (TrCel7A) and the catalytic domain only (TrCel7A core). The influence of the degree of polymerisation (DP) of XOS ligand binding was tested by performing isothermal titration calorimetry (ITC). Activity measurements of TrCel7A were conducted with para-nitrophenyl-β-D-lacoside (pNP-lac) or phosphoric acid swollen cellulose (PASC) in the presence of XOS pools of different DPs. The interaction of XOSs with TrCel7A was investigated using two approaches: ITC binding experiments and activity measurements. The activity measurements were carried out on PASC and/or pNP-lac in the presence of enzymatically prepared mixed XOSs. These measurements require large amounts of XOS (gram-scale) which were not available from the purification of XOSs by size exclusion chromatography. To investigate the influence of the average molecular mass, XOS was split into two fractions by ethanol precipitation. Low-molecular-mass XOS (low XOS) and high-molecular-mass XOS (high XOS) have an average of 4.0 or 8.1 DP xylose units, respectively (Figure 1). HPAEC-PAD analysis of 1 g/L low xylan oligosaccharide and 1 g/L high xylan oligosaccharide. High-performance anion-exchange chromatography with pulsed amperometric detection (HPAEC-PAD) analysis of low xylan oligosaccharide (XOS, open columns) and high XOS (grey columns). The peak from xylobiose to xylopentose was identified by comparison with commercially available XOSs, and longer oligosaccharides were named accordingly. The peak areas of 10 μL of 5 g/L solutions are shown. The response factors for xylobiose to xylopentose were between 0.09 and 0.1 and were almost constant. 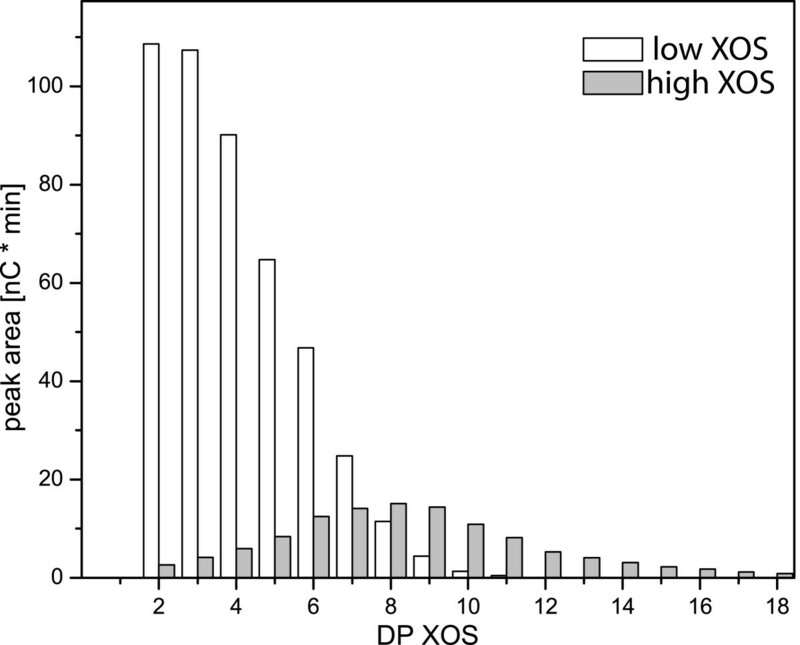 The average degree of polymerisation (DP) (by peak area) of low XOS was 4.0, 80% between (xyl)2 and (xyl)6 and 90% between (xyl)2 and (xyl)7; the average DP of high XOS was 8.1, 80% between (xyl)5 and (xyl)13 and 90% between (xyl)3 and (xyl)13. We chose to assess TrCel7A activity in the presence of XOS using two different assay methods. First, a small chromogenic lactose, pNP-lac, was used in a straightforward stopped assay to assess the activity of TrCel7A . pNP-lac activity has been used by Jalak and Välijamäe  to measure the portion of TrCel7A that has a free, unoccupied active site. The specific activity of TrCel7A for pNP-lac in our study was approximately a factor of 10 lower than that for PASC (Table 1). kcat = catalytic constant; PASC = phosphoric acid swollen cellulose; pNP-lac = para-nitrophenyl-β-D-lacoside; TrCel7A = cellobiohydrolase I. We used a second approach to measure TrCel7A activity in which we quantified the cellobiose release from PASC by high-performance anion-exchange chromatography with pulsed amperometric detection (HPAEC-PAD). Typical Cel7A assays include cellobiase (for example, β-glucosidase) to avoid product inhibition, but many β-glucosidases show activity on nitrophenyl xyloside [17–19] and may also have activity on XOS, which might obfuscate the activity data of the current inhibition studies. To dissect the mechanism of TrCel7A-inhibition by XOS further, we used the modularity of the enzyme to test the influence of the CBM on activity in the presence of XOS. We used two variants of TrCel7A, the full-length enzyme and the TrCel7A core (TrCel7A truncated on DNA level by the linker and the CBM), which allowed us to study the influence of the CBM on XOS inhibition. ITC isotherms at 30°C for both purified and mixed XOSs were readily analysed using standard binding models provided by the MicroCal/GE Healthcare, (Northampton, MA, USA) instrument manufacturer (Figure 2). At 50°C, the signals were small and the quality of the data did not allow regression analysis. This most likely reflects the binding enthalpies becoming smaller at the higher temperature, hence ITC was not a suitable experimental method. The binding constants at 30°C increased from about 103 for the trisaccharide to over 105 for a XOS mixture with a 1:1:1 ratio (8 DP, 9 DP and 10 DP) (Table 2). Table 2 also shows that both enzyme variants had similar affinity for XOS. To study the interaction of TrCel7A and XOS, we measured the binding of pure linear XOSs to TrCel7A by ITC. The binding constants increased strongly with chain lengths of the XOS (Table 1). A typical example of the binding isotherms obtained is shown in Figure 2. Isothermal titration calorimetry experiments. Upper panels: Isothermal titration calorimetry raw data and binding curve of cellobiohydrolase I (TrCel7A) with nine 1-μl injections of xylan oligosaccharide (XOS), followed by fifteen 2-μl injections of XOS. Lower panels: Integrated peak areas (squares) and the best fit of the model. All binding experiments were conducted at 30°C. Left: A 1:1 mixture of xylooctaose (xyl)8 and xylononaose (xyl)9 was injected into TrCel7A. Right: The high XOS mixture was injected into TrCel7A. DP = degree of polymerisation; TrCel7A = cellobiohydrolase I; XOS = xylan oligosaccharide; - = no data. aEstimated on the basis of high-performance anion-exchange chromatography with pulsed amperometric detection traces and binding experiments (n = 3). pNP-lac was used as a small model substrate for Cel7A [14–16, 20]. The effect of low XOS and high XOS was tested with pNP-lac as the substrate (Table 3). The addition of 1 g/L low XOS reduced the remaining activity to 21% or 15% for TrCel7A core or TrCel7A, respectively. The addition or 1 g/L high XOS removed 90% of the control pNP-releasing activity. In these experiments, the control activity TrCel7A and TrCel7A core did not differ substantially, indicating that the presence of the CBM had little or no effect on the activity on the soluble, small-molecule pNP-lac. 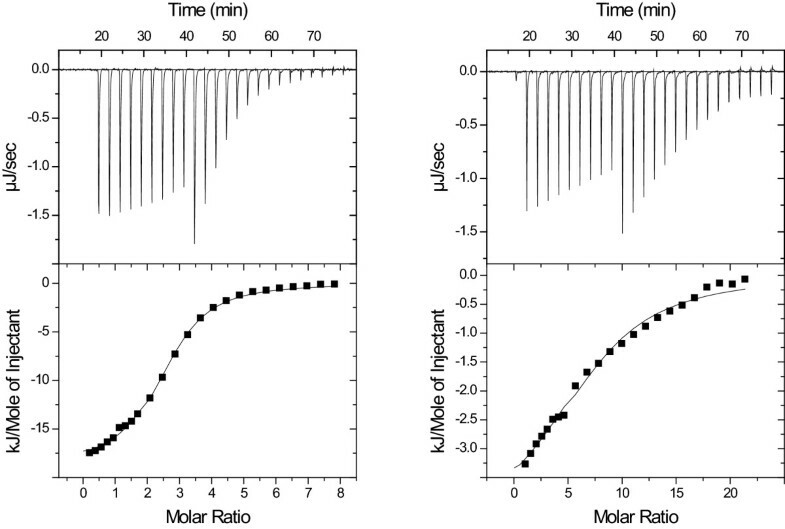 Dose-response curves were generated for TrCel7A at 50°C (Figure 3). The curve for high XOS declined more sharply at lower concentrations than the inactivation curve of low XOS. 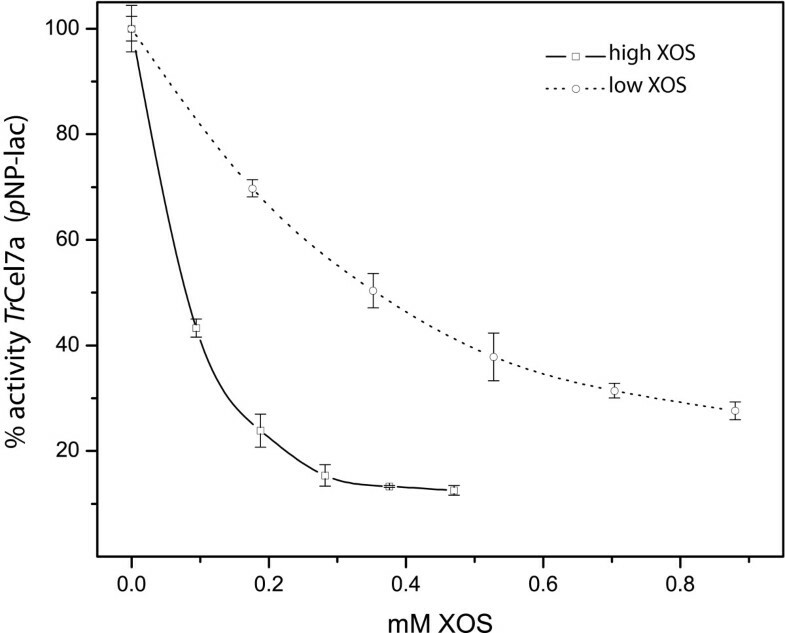 This demonstrates the relatively greater importance of molecular length (high XOS vs low XOS) over the molecular concentrations of XOS. cb: cellobiose-solubilised; pNP = para-nitrophenyl release; pNP-lac = para-nitrophenyl-β-D-lacoside; TrCel7A = cellobiohydrolase I; XOS = xylan oligosaccharide. aThe cellobiose release from phosphoric acid swollen cellulose (PASC) in the presence of pNP-lac by TrCel7A and TrCel7A core at 50°C and 30°C was measured in separate experiments. The deviations are the standard deviations of five independent experiments. bThe cellobiose release from PASC was independent of pNP-lac (Table 4). Inhibitory effects of xylan oligosaccharide on the para -nitrophenyl-lac activity of Tr Cel7A. The inhibitory effects of high xylan oligosaccharide (XOS) (open squares) and low XOS (open circles) on the para-nitrophenyl-lacoside (pNP-lac) hydrolytic activity of cellobiohydrolase I (TrCel7A) at 50°C are shown. 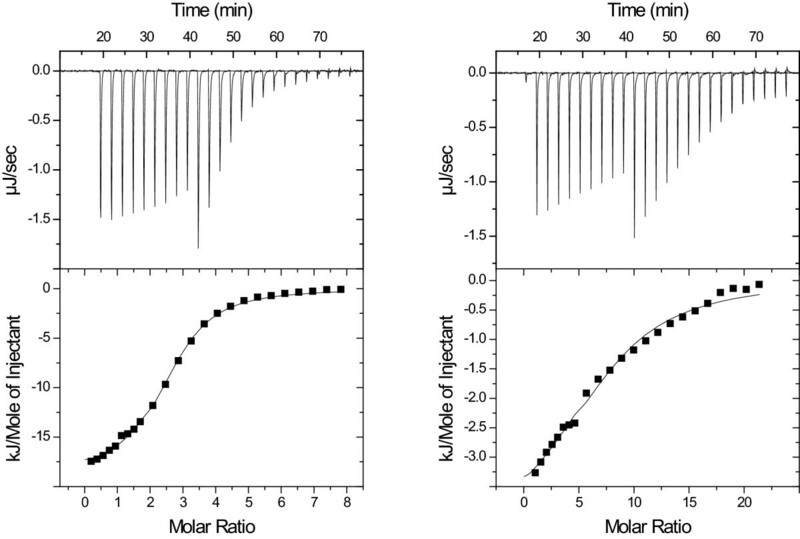 The molarities based on the estimates measured by high-performance anion-exchange chromatography with pulsed amperometric detection analysis (see Figure 1), 0.5 g/L high XOS and 0.5 g/L low XOS, were estimated to be 0.47 mM and 0.88 mM, respectively. The error bars represent the standard deviations of three experiments. TrCel7A activities were evaluated with PASC in the presence of pNP-lac substrate (Table 3). Control experiments revealed that the presence on 1 mM pNP-lac changed the release of cellobiose by 10% (Table 4), which for most of the samples was within the standard deviation. The specific activity of TrCel7A on PASC was twice as high as that of TrCel7A core. (Table 1) The susceptibility to XOS inhibition of TrCel7A and TrCel7A core on PASC differed widely. Low XOS practically did not change the activity of TrCel7A, and TrCel7A core produced only 60% of the cellobiose in the presence of low XOS. High XOS reduced the activity of both tested TrCel7A variants. Full-length TrCel7A activity produced 80% of the cellobiose, and TrCel7A core activity was reduced to values close to 50% of the cellobiose produced without added XOS. cb: cellobiose-solubilised; PASC = phosphoric acid swollen cellulose; TrCel7A = cellobiohydrolase I; XOS = xylan oligosaccharide. The deviations are the standard deviations of five independent experiments. The activity of unbound TrCel7A and TrCel7A core in the presence of PASC was followed by pNP-lac hydrolytic activity (Table 5). The pNP-lac hydrolytic activity of TrCel7A and TrCel7A core was, respectively, 7% and 20% of the total activity against pNP-lac observed in the absence of PASC (Table 5). This indicates that 93% or 80%, respectively, of the TrCel7A or TrCel7A core active sites are not available for pNP-lac hydrolysis. The addition of low XOS and high XOS further reduced pNP-lac hydrolytic activity. Again, as we observed with regard to cellulolytic activity on PASC, high XOS produced a greater reduction of pNP-lac activity than low XOS did. Because the pNP-lac activity of TrCel7A in the presence of PASC was already reduced to 7% of the initial pNP-lac activity, further reductions in pNP-lac activity induced by the addition of XOS could not be quantified. The fractional decrease in pNP-lac activity brought about by PASC was larger at 30°C than at 50°C, which indicates that more enzyme may be bound at the lower temperature. PASC = phosphoric acid swollen cellulose; pNP = para-nitrophenyl; pNP-lac = para-nitrophenyl-β-D-lacoside; TrCel7A = cellobiohydrolase I; XOS = xylan oligosaccharide. The percentages were calculated on the basis of the total pNP activity shown in Table 3. The deviations are the standard deviations of five independent experiments. aThe Ki for cellobiose in the pNP-lac assay is 20 μM, which is exceeded here. The activities are underestimated. bThe detected absorbance changes were below 0.02 absThe activities were too low for reliable quantification. We tested the effect of XOSs on the activity of two TrCel7A variants in samples with PASC, pNP-lac or both. The binding affinity of XOS with known DP was also quantified for both enzyme variants. The combined interpretation of the binding and activity data suggests that XOS binds to the active site of TrCel7A and hence exerts competitive inhibition. Moreover, our results suggest that the affinity for the active site follows the sequence PASC > XOS > pNP-lac and consequently that XOS is a much stronger inhibitor of pNP-lac hydrolysis than of PASC hydrolysis. Next we discuss arguments for and aspects of this proposed mechanism of XOS inhibition. With pNP-lac alone (Table 3), the specific activities of TrCel7A and TrCel7A core were essentially the same and the addition of low XOS or high XOS resulted in severe and similar activity loss for both enzymes. Hence the CBM does not play a role for the small, soluble substrate analog pNP-lac. These observations and the strong affinity of XOS observed for both enzyme variants suggest that XOS bind more strongly than pNP-lac and hence inhibits their activity. The inhibition by XOSs was much less pronounced when PASC was used as the substrate. In fact, the intact enzyme was not detectably inhibited by low XOS (Table 4). This difference most likely reflects the higher binding affinity of PASC strands to the catalytic domain of TrCel7 compared to the binding of pNP-lac to the TrCel7A catalytic domain. An analogous relationship was measured with cellobiose as a competitive inhibitor. The reported Ki value for cellobiose with pNP-lac is 20 μM , and for bacterial cellulose it is approximately 50 times higher at around 1 mM . This hypothesis is also in line with the observation that high XOS, despite the lower molar concentration (1 g/L equals about 4 mM), was caused greater inhibition than low XOS (1 g/L equals about 8 mM) (Table 3 and Figure 3). This can be simply explained by the higher binding affinity (Table 2) of high XOS, which overcompensates the lower molarity of high XOS. Using PASC as a substrate, we observed that the presence of the CBM in TrCel7A plays a more prominent role in the sensitivity to XOS inhibition. The pNP-lac measurements in the presence of PASC showed that at most 7% of the added TrCel7A had an accessible active site. Thus we concluded that the missing 93% pNP-lac activity is removed by binding of TrCel7A to PASC, followed by occupation of the active site by a cellulose strand. The TrCel7A variant without CBM showed an increased pNP-lac activity (20% of the added activity is free in the buffer, when compared with the full length enzyme. This indicates that the presence of the CBM decreases the probability of a free active site in the presence of PASC. Our results derived from the two measurements combined gives a strong indication of the mechanism of activity inhibition of TrCel7A by XOSs. In a hydrolytic reaction, more than 80% of TrCel7A is bound to the substrate (Table 5). The presence of the CBM changed the equilibrium between free and bound TrCel7A from 20% free to less than 10% free in our experiments. This shift was even more pronounced at 30°C than at 50°C. The presence of the family 1 CBM in TrCel7A plays a pivotal role in its location and thereby its sensitivity to inhibition by XOSs. As the location equilibrium is shifted towards the insoluble substrate, the sensitivity to XOS inactivation of TrCel7A decreases. The results of our ITC experiments (Table 2) show that increasing the chain length of XOS is the main factor influencing binding affinity (Figure 4). The CBM seems not to interact with XOS, as the binding constant does not increase when the CBM is present. Interestingly, the binding of XOS observed by ITC also influenced the activity of TrCel7A on PASC, but to a certain extent PASC and XOS compete for binding. The activity data also confirmed the ITC binding data regarding the effect of the chain length, because high XOS reduced the activity of TrCel7A more than low XOS did. Additionally, temperature influenced the competition between XOS and PASC. At 30°C, the productive binding of TrCel7A to PASC was greater. At 50°C, the equilibrium shifted slightly towards the unproductive binding of XOS. On the basis of the measured binding enthalpies and the van 't Hoff equation, we predict that the binding constant for the XOS will decrease by about 40% when the temperature is increased from 30°C to 50°C. However, changes in the affinity to cellulose are unknown, and at this point we can only speculate about the balance between the individual binding constants at higher temperatures. Cartoon representing the inhibition mechanism of xylan oligosaccharide with different substrates. (A) Xylan oligosaccharide (XOS) inhibition mechanism with para-nitrophenyl-lacoside (pNP-lac) used as the substrate. (B) XOS inhibition mechanism with PASC used as the substrate. In both cases, the activity of cellobiohydrolase I (TrCel7A) was decreased by the presence of XOS. The active site was most likely occupied by unproductively bound XOS, preventing the substrate from entering the active site tunnel. The degree of inhibition is dependent on the ratio of the binding affinities between the substrate and the inhibitor. XOSs are linear oligosaccharides with the same type of β(1→4) bond as cellulose. The structural similarity between XOSs and cellulose may make it possible to fit XOS sterically into the active site of TrCel7A. The results of our ITC-binding experiments reveal that increasing the chain length of XOS promotes binding to TrCel7A. The highest binding constants were found for XOS, which approximately matched the length of the TrCel7A active site (Table 1). In our opinion, it is plausible that XOS could be a competitive inhibitor of TrCel7A by occupying the active site in place of the substrate. This interpretation is in accord with both the absence of a CBM effect in the binding studies and the presence of such an effect for PASC hydrolysis, but further (structural) studies are needed to unequivocally confirm this hypothesis. In principle, all active cellobiose-releasing complexes are formed with TrCel7A recruited from the small free pool of enzyme in solution; therefore, XOS inhibition can play a major role in reducing TrCel7A activity. This study clearly shows that a higher incubation temperature of 50°C increases the XOS inactivation of TrCel7A. In biomass hydrolysis experiments, the addition of xylanases and/or xylosidases increases the overall yield of glucose and xylose [4, 7, 22, 23]. The observed synergy between xylanases and cellulases can at least partly be explained by the offset of cellulase inhibition as XOS is hydrolysed to low DP, which does not bind strongly to the active site of cellulose. It remains to be discovered whether this is only the effect of the addition of xylanases or whether there are other substrate-related effects, too. Mixed and pure XOSs were produced as described by Baumann et al. . Monodisperse xylotriose to xyloheptaose was obtained in 100-mg amounts, and mixed pools were obtained up to xylodecaose as described in Table 3. High XOS and low XOS were separated by ethanol precipitation (4:1) of high XOS from a solution of mixed XOS (0.5 L at 14 g/L concentration) in 50 mM sodium acetate, pH 5.0. The fine precipitate (high XOS) was separated on a glass fibre filter and dissolved in water. After freeze-drying this solution, 2.1 g of low XOS and 4.6 g of high XOS were obtained. Both fractions were analysed by HPAEC-PAD (Figure 1). We found that low XOS contained saccharides from xylobiose to xylose11 with 80% of the relative peak area between xylobiose and xylopentose, whereas high XOS contained saccharides from xylobiose to xyl18 with 80% of the relative peak area between xylotetraose and (xyl)12. The average molecular mass values of low XOS and high XOS were calculated as 4.0 and 8.1 xylose units, respectively, after the relative peak areas had been determined. TrCel7A core was produced by site-directed mutagenesis of a TrCel7A sequence [UniProtKB:P62694]. The protein sequence of the catalytic domain used was the same sequence as that of TrCel7A but truncated by the carboxy-terminal CBM and the linker sequence. The mature TrCel7A core contained the first 436 amino acids after the signal peptides (17 amino acids). TrCel7A [UniProtKB:P62694] and TrCel7A core were both produced heterologously in Aspergillus oryzae by Novozymes A/S (Bagsværd, Denmark) according to patent WO/2000/039322 and were purified as described by Praestgaard et al. . The binding affinity of TrCel7A and TrCel7A core was measured at 30°C in an iTC200 power-compensated isothermal titration calorimeter (MicroCal/GE Healthcare, Northampton, MA, USA) with a cell volume of 200 μl and by using an injector equipped with a 40-μl syringe. All binding experiments were carried out at 30°C with 1,000 rpm stirring. In a typical binding experiment, the cell was filled with 40 μM cellobiohydrolase, and pure XOS (1.25 mM) or pools of mixed oligosaccharides (low XOS 5 g/L about 8.4 mM or high XOS 5 g/L about 4.4 mM) were injected according to the following protocol: initial equilibration for 16 minutes, then nine injections of 1 μl after 150 seconds, followed by fifteen injections of 2 μl. Data were analysed using Origin 7.0 software (OriginLab, Northampton, MA, USA) with the add-on provided by MicroCal/GE Healthcare. Cellobiohydrolase activity was measured as cellobiose release from 1 g/L PASC at 50°C or 30°C with 300 rpm shaking in an Eppendorf heating block. TrCel7A and TrCel7A core amounts were adjusted to release 100 μM or 127 μM pNP from pNP-lac when incubated at 50°C for one hour. After one hour of incubation, PASC was removed by short centrifugation for 20 seconds in a tabletop centrifuge. An aliquot of the supernatant (0.5 ml) was removed and incubated at 99°C for 20 minutes at 300 rpm in an Eppendorf heating block to inactivate the cellobiohydrolase. We analysed 10 μl of the supernatant by HPAEC-PAD. XOSs (200 μl) were added to a final concentration of 1 g/L, which is approximately equivalent to 1.7 mM low XOS or 0.9 mM high XOS. The amount of free cellobiohydrolase was quantified as pNP release from pNP-lac as described by Jalak and Väljamäe . A simple quantification of TrCel7A activity is hindered by several parameters. TrCel7A is product-inhibited by cellobiose. In the hydrolysis of bacterial cellulose, the product inhibition by cellobiose was measured by Gruno et al. as Ki approximately 1.5 mM [14, 21]. Thus we chose to limit the product inhibition by restricting the amount of produced cellobiose to a maximum of 1 mM. The values that we obtained for pNP-lac activity are most likely underestimates, since the Ki for cellobiose is 20 μM for the hydrolysis of pNP-lac , and the cellobiose concentration was higher in most of our experiments. We thank Dr Katja Salomon Johansen at Novozymes for the enzyme samples of TrCel7A. This work was supported by The Danish Council for Strategic Research (grants 09-063210 and 2104-07-0028) and by the US Department of Energy (grant DE-FC36-08GO18080). MJB and KB are employed by Novozymes A/S (Bagsværd, Denmark), which is a major enzyme producer. PW declares no competing interests. MJB designed, planned and conducted the study, and drafted the manuscript. KB provided the enzymes and reviewed the manuscript. PW participated in the critical discussion of the results and finalized the manuscript. All authors read and approved the final manuscript.